This was my first off road half marathon. Being a huge geek I wanted the Star Wars medal for this race, so I signed up. 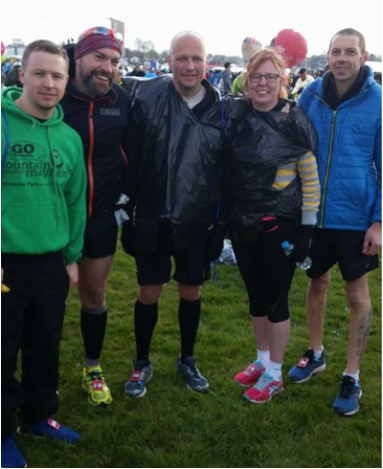 This was to be half marathon in Church Stretton, when I realised how bad it was, I roped in 4 friends as misery deserves company. So at 9am that morning I picked my friends up and set of. The mood in the car was nervous, and got worse as we pulled in to the car park, and looked at this huge hill facing us. Everyone gathered before 10am in the Car Park of Carding Mill Valley for the briefing, here I met fellow WRR nutters Sam and Jon, and about 150 other runners, some dressed in Star Wars garb, we spotted Stormtroopers, Leia’s and Jedi. The race started with a huge climb up a path from the car park, passing a food at water station at 2.5 miles on to to the trig point at Pole Bank. The views were as fabulous as the weather. I stopped for lots of pics. Still heading down to reach the village of Little Stretton, this was making me nervous as I knew we would have to climb at some point. We went through the camp site, and then the climb from hell started, it seemed to climb for ever. We ran/walked and crawled along side a river. Until we got to the aid station. I have never been so glad of flat cola, jaffa cakes and onion rings. Once full we set off again. The fun part of heading back to the car park, there was one more ascent then downhill. This was not as lovely as I thought it was going to be, is started off as grass and quickly tuned to shale. My quads were starting to ache at this point and was so glad for the last half mile down the path to the finish. It was hard, hot and I will be doing it again next year. I will try and rope more of you in. ​Well here I am, one full year on from starting the beginners with WRR in 2015 about to embark on my first half marathon in Chester!!!! Nervous . . . nah . . . ABSOLUTELY TERRIFIED more like!!!! Haven't done the training I wanted to due to work and home life commitments. Being a working single parent it's been hard to get the additional training, let along follow any sort of plan but here I am wearing my club vest with pride and feeling quite emotional about how far I have come in a relatively short space of time. . . . . I'm also full of cold, which is just typical but there you go. The weather is a cool 8 degrees as the sun is hiding behind the clouds before the start and looks like there is going to be lots of support and people cheering us on the way around. Looking forward to a few shouts of “come on Julia!” or “come on Wrekin!” out on the course. It was Louise Minchin from BBC Breakfast set the race off, there was 5242 starters from Chester Racecourse. We headed off straight up a hill (terrific) and into town. There was lots of people on the streets considering it was a 9am start time!!! Having never been to Chester before I wanted to take in some of the old buildings as I was going but was concentrating on making sure I got ahead on the 2hr 30min pacer so I didn’t pay all that much attention to the scenery. By mile 3 the route had quietened down and everyone beginning to settle into their pace. There was a couple of lads with their guitars and an amplifier playing some tunes as we headed out and then there was a band playing at one the pubs in the distance, they sounded quite good to be honest so I gave them a clap as I went past. Mile 4 – I was about 45 minutes into my race when the race leader went flying past on the other side of the road . . . “what the! !” amazing. He was well ahead of the guy who was in second place and everyone my side of the road was cheering them on, great sportsmanship. At the water station at 6 miles they had soldiers (well probably cadets!) handing out gels and water, it was welcome sight let me tell you, as by then the temperature was getting HOT HOT and the wind had dropped significantly. I was starting to regret wearing a T-shirt under my Club vest that’s for sure. And then the course turned back around so you were running past all the runners that were behind you. Was good to give them some encouragement and I spotted an older gentleman dressed at The Flash and the man dressed as a running shoe – I will never understand why people dress up for long distance runs lol. The next couple of miles are really tough, no crowds and just farm land with all the smells that brings, cleared my sinuses anyway I can tell you. All you could hear was the thud thud of everyones trainers and the birds chirping . . . hard to keep motivated, especially with the blazing sun now and after all the gradual inclines of the first few miles you can tell people are beginning to flag . . . there are now lots of walkers. But I'm not giving in . . ok, maybe I will, but just to gather some energy and then I'm off again . . . finally hit the 10 mile marker and there are signs of life!!!! The crowds start to gradually build up again. And boy, oh boy its HOT, I come over the brow of yet another hill and there is a welcome site, a man with a hosepipe spraying everyone YEY!!!!! Some relief lol. Get to 11 miles and the streets are FULL of people and music again, awesome. Up comes 12 miles and the realisation that the last mile is yet another hill, a BIG ONE!!!! People are shouting “Come on you’re nearly there!” and “One last push!” – I really want to shout something back but I resist the urge and plough on up the hill . . . get about half way, no its no good going to have to walk some of it . . . Scooby Doo almost sprints past me – how does he do it??!!! He’s been backwards and forwards past me now about 6 times!!! Finally get to the top of the hill, all the crowds are shouting my name and I'm trying my best not to burst into tears as the emotion of what I have just achieved hits me . . . I can see the finish!!!! This morning about 7.30 the alarm went off setting me up for my 1st 10k race at Market Drayton. Am I nervous…. No, excited…… maybe, up for it and going to enjoy the day…… definitely. A fantastic sunny day for a race that is well liked by so many Wrekin Road Runners. Early arrival meant no problems with parking, no queues for the park and ride and plenty of time to mingle, get my t-shirt and any last minute preparations. I didn’t have any nerves about finishing the run even though I wasn’t expecting a great time being as it was my first race, also it was a very hot day. 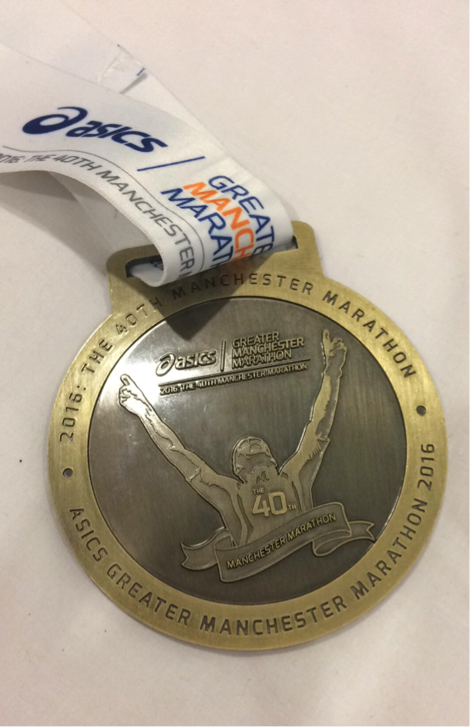 All I wanted to do was run my own race and enjoy being part of the UK’s best 10k race knowing that whatever the time was at the end was irrelevant. 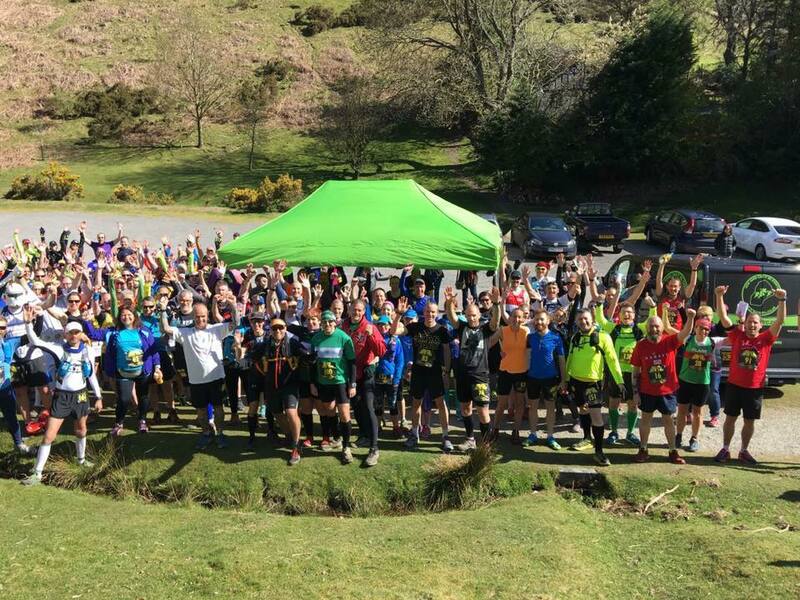 About 60 Wrekin Road Runners came to enjoy the run, all in their new kits ready for the team photo, many of them having ran this course before but others like me for the first time. 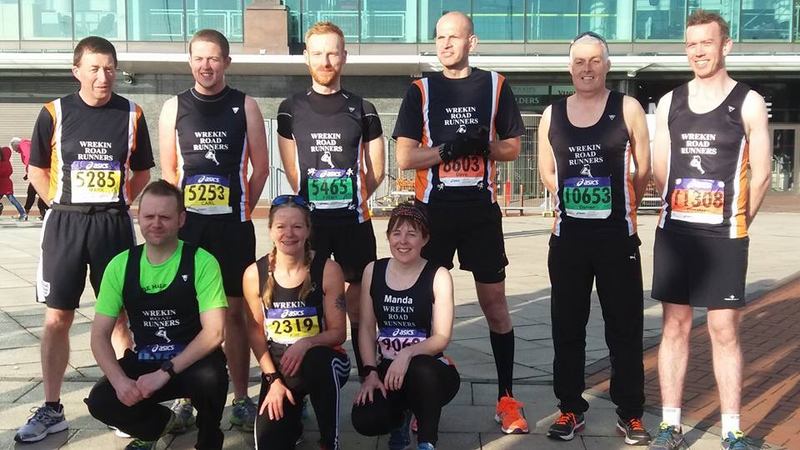 To say that Market Drayton is a small town, the race is very well supported along the route, music through the town and plenty of stalls and refreshments to keep the supporters happy and the kids from getting bored whilst we were away running. I am really glad that last year I joined the club in the beginners group as this gave me a sound basis for running and the knowhow to achieve my race. 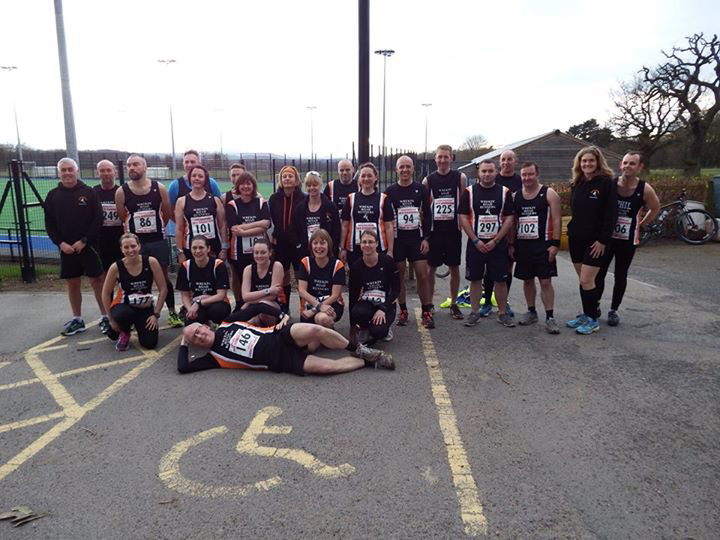 Many Wrekin Road Runners have given me tips, advice and information about how to make the most of my running. At one point on my way around, two girls were discussing about not being properly prepared having only done fun runs. Thankfully this was not the case for me because of the help and support that I have received from group members. Not once did I feel like quitting or that it wasn’t possible for me to finish. Even though my time wasn’t the best, the cheers that I got around the course and especially at the finish from my friends in the club were brilliant. So now I have my first shiny 10k medal and I know that it won’t be my last! ​Expo done, got the number, seen the blue lines on the road - now time for breakfast, and I have to say never have I been up so early for a 10am race start. 7.30 catch up with Lee and Paul heading off towards the start line on a cold, wet and breezy morning. The streets are almost empty, the familiar London kit bag identifying those who are all on the same journey. Crossing over a very quiet tower bridge, a wave and good luck shout to Deb walking to meet Lee - at the red start. Myself, Paul and Dave are off to the blue start. Been advised not to worry about the getting to the start as London Marathon are so well organised with event support across London, unfortunately due to our eagerness to get to the start the event support staff were still being briefed; a London transport employer came to our rescue and made sure we were on the right platform. Train taken, short walk taken, the noise steadily increases as we approach the start. We're moving, people slowly start to remove bin bags and warmer clothes, countdown as walk through each pen, 7, 6, 5, 4,... Now 2 people start to trot and there's the Start.. Just over 10 minutes after the elites, I cross the start line, my marathon has begun. The 1st few miles my mantra was slow down, keep it steady, soak in the atmosphere. The 1st 10k just happened, and the Cutty Sark “oh my!” doesn't matter that we almost came to a walk, due to the mass of runners and narrowness of the path, but the noise, the atmosphere, the boat!! That's a moment I will remember. Race continues with high 5s and the odd word or two to fellow runners, taking in all the different costumes, I pass the pink man, a T-Rex, and a testicle. Coming up to 10 miles a little touch of my shoulder, yeah a fellow WRR - Kathy, she looking very fresh, conversation exchanged and Kathy slowly pulls forward, I decide not to go with her. Tower bridge - memory number 2, smile there's are photographer... Half way, my eyes become alert, my mantra stay right yes there they are WRR: screaming, shouting, smiling. Stop for a hug, I hear don't stop get going, as I run off still hear the cheers and words of encouragement. The weather has been kind, no snow and it’s warmed up from this morning. Perfect running conditions. 14 miles, 16 miles - 10 to go. Start to count down, and then go from feeling great to “erk!” Cross 17 miles decide to walk for a short while, assess what hurts and make a decision, while I walk, pats on my back, you can do it, are you ok, roars from the crowd go Wrekin. Off I go again, turn the corner to the only real hill ( WRR would call it a slope ). 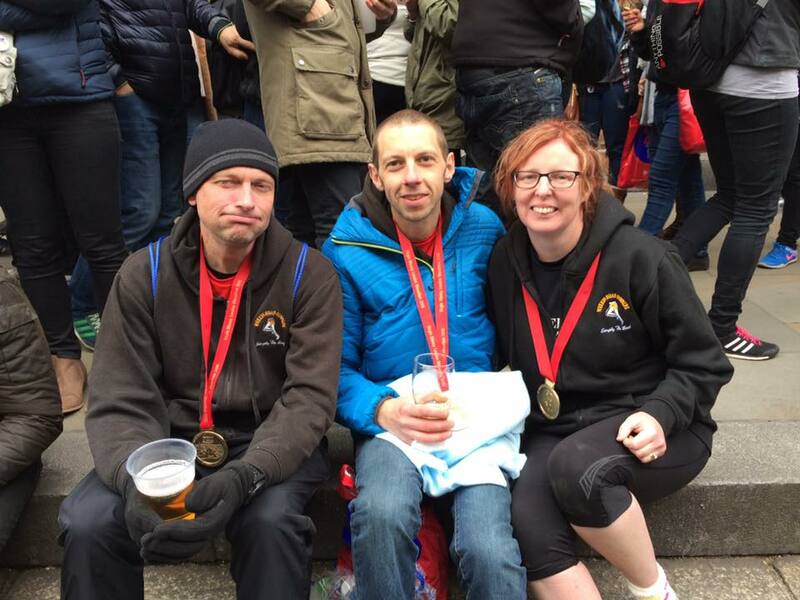 in the London Marathon, ahh to walk or not to walk. surprised between 18 and 21 miles several shout outs and WRR appear again. One may question whether London has reached its capacity as running at my pace approx. 10 minute mile there were times when the course struggled with the number of participants. 22 miles my family and friends, big smiles and shouts across the road. I’m feeling good, plan says take a gel, belly says really do you wanna do that? Mind questions can I do it without... No gel and let's play pick a shirt instead, 5 k to go first the pink one, then the yellow, spot someone ahead and try to catch them. The under path, where participants walk, pee and the music echoes, home stretch London eye, Big Ben, there it is 25 miles. The longest mile, not no 26 mile marker at London, to completely confuse you.. 800m...600m..400m hello queen, 200m here it is the mall and that 365 yards to go.. Another shout out.. Yeah WRR! 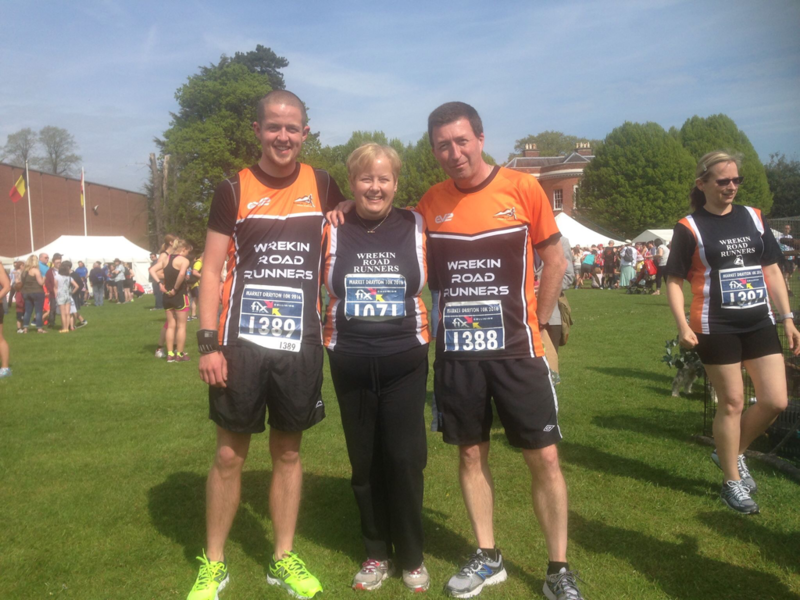 A massive thank you to all the WRRs who supported on the course you are all just brilliant! Loved it more this time than the 1st.... That final walk through the protected area and bag collection, I believe is longer than 26.2 miles... People crying, laughing elated at their achievements. All just wanting to get to their ultimate final destination meet family and friends... Now that's another challenge. London have got it right, the organisation is brilliant, support is second to none Singing, music, shouts, high fives and jelly babies. Would I do it again? Definitely! If there was a negative I would say the at times running through the water stations was a little risky, flying bottles, and particularly around Canary Wharf the narrows paths were littered with disposed bottles... Ankle injury risk. Personally for me it has reignited my confidence in running. ​Well the weekend had arrived, after months of training and 16 weeks of no alcohol, we set off for the train station early on Saturday morning. There was a big crowd of us booked onto the same train. I'm not sure the other passengers knew what had hit them. It didn't take long for team Chardonnay to start popping the corks on the Prosseco, I thought Cherie had burst my ear drum when opening one of the bottles as the cork went flying into the air. Then out came all the food, I think we had enough for the whole train. Emma and Ceri had bought a full picnic, anybody would think we were going for a week! On arriving in London, we made our way to the hotel but were to early to check in. Esther came to our rescue and let us put all our cases in her room so we could then go and collect our numbers. It was really busy in the expo so we collected our numbers and just had a quick look around but didn't stay long. In the evening Esther had kindly arranged for us all to go to an Italian restaurant called Strada, we had a great evening. We all headed back to the hotels fairly early as it was going to be an early start. Race day had arrived, I met Paul and Esther for breakfast at 6:30am there were a few race day nerves setting in. After I said my goodbyes to them I went to meet Deb Millington as we were in a different start to the others, we were starting with the celebrities. We got to the start at about 8:30 and were stood around soaking up the atmosphere waiting for the start. I set off with a plan in mind. I went through 5k at 19 mins which was exactly what I wanted. It was very busy and I got pushed quite a bit, but didn't let it bother me too much. I got talking to a couple of other runners which helped hit my target of 10k in 39mins and I was feeling great. Suddenly I was at Tower Bridge the crowds here are intense and very loud, it's great. As I was coming to half way I checked my watch: 1hour 24mins, I was 4 mins ahead of where I wanted to be and feeling amazing. I soon heard some voices I recognised at around 13.5 miles, yes you guessed it! Team Chardonnay were there in force and what a great buzz it gave me to see and hear them! At mile 16 my plans started to unravel quickly. I started to feel pain in my heel. I carried on but by mile 18 the pain was so bad I had to stop. When walking I didn't get the pain so I tried to run again but it was no good the pain was there when running. The crowd were trying to cheer me on but I just couldn't run for the pain. At mile 21 John passed me then at mile 22 I stopped to talk to team Chardonnay. As I carried on I got talking to guy from South Cheshire harriers, called Pete, who had also had to stop running due to a knee injury. We kept each other company the rest of the way. 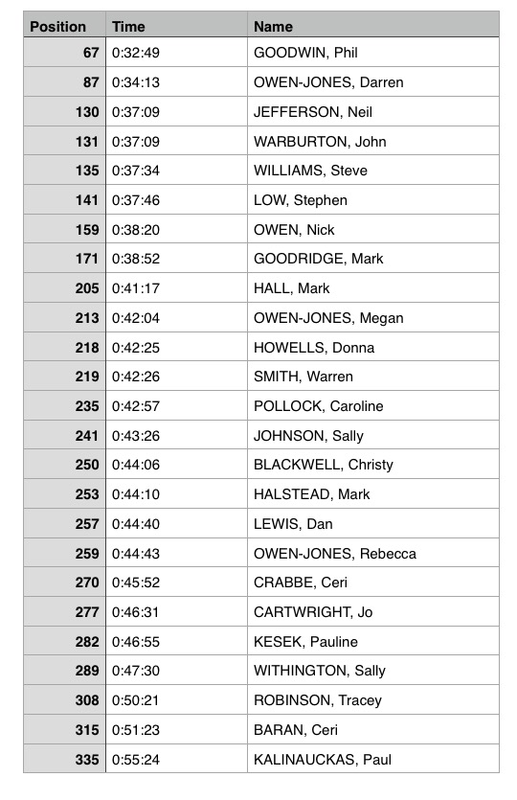 At mile 22.5 my worst nightmare happens, Paul Spriggs passed me, this is coming to be a bit of a habit in races!! I was jealous how comfortable he looked despite this being his second marathon in 2 weeks. Then when Deb passed me I looked at my watch and knew she was going to smash the sub 3:30 well done Deb. At mile 24 I tried to run again but it was still hurting. Pete and I kept trying to pull the other along we though about a pub stop but kept going and we got to do a little sight seeing. The finish was in sight I was so glad to see it. Normally I enjoy finishing a race but I was just glad this was over. I put my medal straight in my bag and headed to the pub to drown my sorrows. ​So, fell running, what's all that about then? 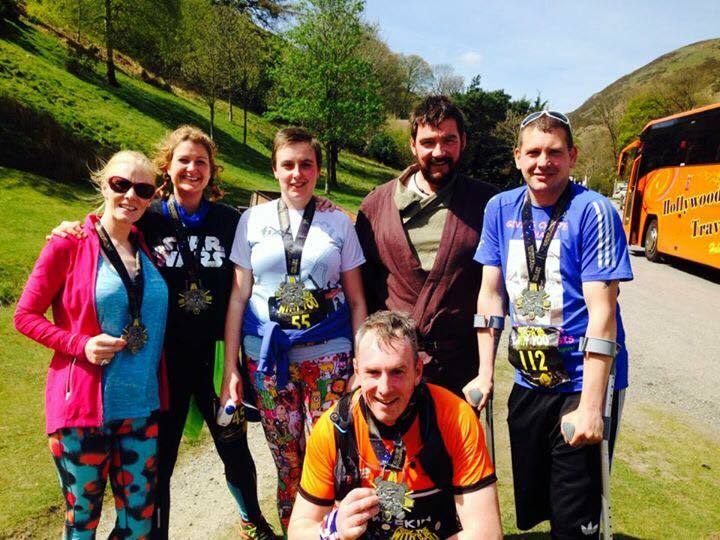 You pay £5 to run up a hill which you can run up for free the very next day!!! So why am I still smiling days later? 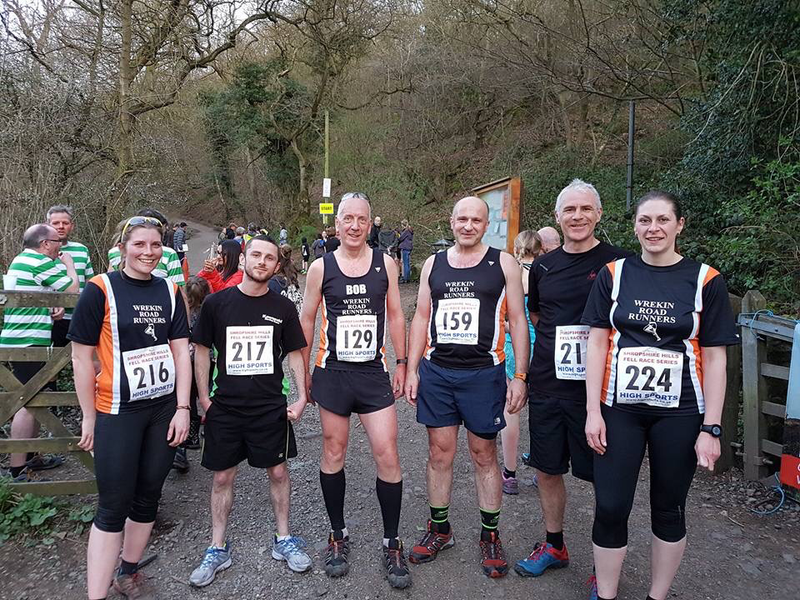 The Wrekin Streak is the first race of the the Shropshire Summer Series of midweek fell races. The race is a straight forward run from the gate at the bottom up the Wrekin to the top and back again. Whilst not the most wild or remote location for a "fell race", it was a perfect location to find out what this was all about. The race report can be neatly summed up in the words of Christy Blackwell, "It's quicker coming down than going up!". First, imagine the car park at the Forest Glen on a normal, warm, sunny spring evening, and then try to park a further 150 cars. The parking was a joke. Unfortunately some people didn't see the funny side when they had to peel the parking tickets off their windscreens after the race. Parking achieved we paid our money, collected our numbers and assembled just above the gate for a race briefing that only the first 6 people could hear. Moments later someone shouts "Go" and we're off. We pick our way very steadily up the path to the Halfway House saving what energy we can for the rest of the climb. I'd like to say that I ran it all, but I found that my power-walking was actually faster than my "running" on the steep bits. I had thought I would run this race for fun and a bit of training, well that didn't last. I don't care if that runner looks like my Dad, he's 'aving it!!! Fell racing soon teaches you to respect all runners, no matter how old they look. I watched the bloke who looked like my Dad disappear up the hill ahead of me. I'm not sure where I was when the lead runners started to come back down towards me but I was quite pleased how far up the hill I was at that point. They were young, fit and crazy. Just below the Halfway House the sound of footsteps behind me (a Harrier) caused me to lose all inhibitions and common sense. I crossed that boundary into stupidity. I ran the last stretch like a man with his shorts on fire, my Vaselined thighs started to smoulder. I was a maniac... But the Harrier had to eat my dust all the way down! Under normal circumstances I would say that I'm too old for this sort of racing, but this is fell racing. I look like a Spring chicken compared to some of these gnarly old buggers. It was only after the race that I realised that I had run the whole race without checking my Garmin once, there was no point. You run the hill that is in front of you, either up or down, your pace has no bearing on what you are running. The next race in this series is the Caradoc Classic (5.7km only) on Wednesday 11th May. If you think you might enjoy this, then you will. This was great fun, I loved it, I'm still smiling writing this. PS Nice to see Little Miss Bendy Thumbs Sam Jones back running again and finding her running mojo just in time for London. Only saw 5 other WRR's today, and of those I only recognised Lord Hurley. Well done everyone else who ran. No pics I'm afraid, although Ian Emery did take some. 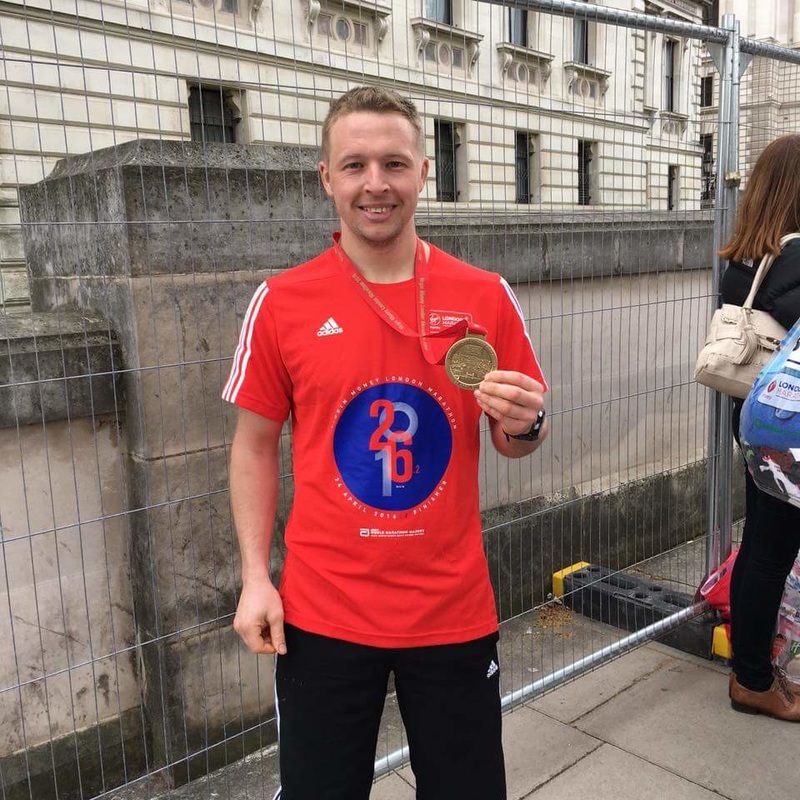 Way back in May 2015 I decided I had very little chance of getting in the London marathon so entered Paris instead. A short hop on the Eurostar (less than 2hrs 30 mins) and we were there. Picked up my race number from the expo then settled in for a early night. Up next morning like a lark and made my way to the start. Panicked a bit when I saw the elites going off and I hadn't even bag-dropped. No need to worry because the start times are well spread out. Headed down the Champs Eylsee and joined the 4:15 group. The route takes you out to the east of the city past loads of land marks that I recognised but couldn't name and then through a lovely park. Back along the river and past some big tower thingy and then through another park. A fairly flat route combined with a unseasonal 20 degrees made it a very pleasant morning run indeed. My good friend Jo asked if I would like to do a 10k on a flat course in a lovely park chasing Zebras. Well, we arrived on location in Cannon hill park, not a hill in sight, nor were there any Zebras. Zebra seemed to be the charity name! The start time arrived and as I had been running well recently, a parkrun PB AND a sexaraton one, I thought mybe a 10k PB could be on, so I muscled in and lined up on around the 5th row of a narrow starting chute. We were off, going slightly down hill to start and on a good pace on this flat course. Almost a mile in and I was not feeling good, then we turned left and a monster hill awaited... in true style I become aware a PB was not on and tried to enjoy it (as the park was open to the public and a nice day, it become "dodge the untrained child" to stay on the course). Lap one complete and the thought of that hill again reduced my already slow pace to even slower one. Up the hill with no walking and passing a few people, on the way down I saw Jo at the top. Needless to say, I started to have a small second wind and hurdled a couple of stray mutts! Then came the real race, a Chinese family seemed content to encourage there small child to chase the ducks... As were both heading for the same gap I narrowly beat the 3 year old, and bought the ducks some time to escape, before they become tonight's roast dinner! Next time if I want to chase a Zebra, it will be on Safari. 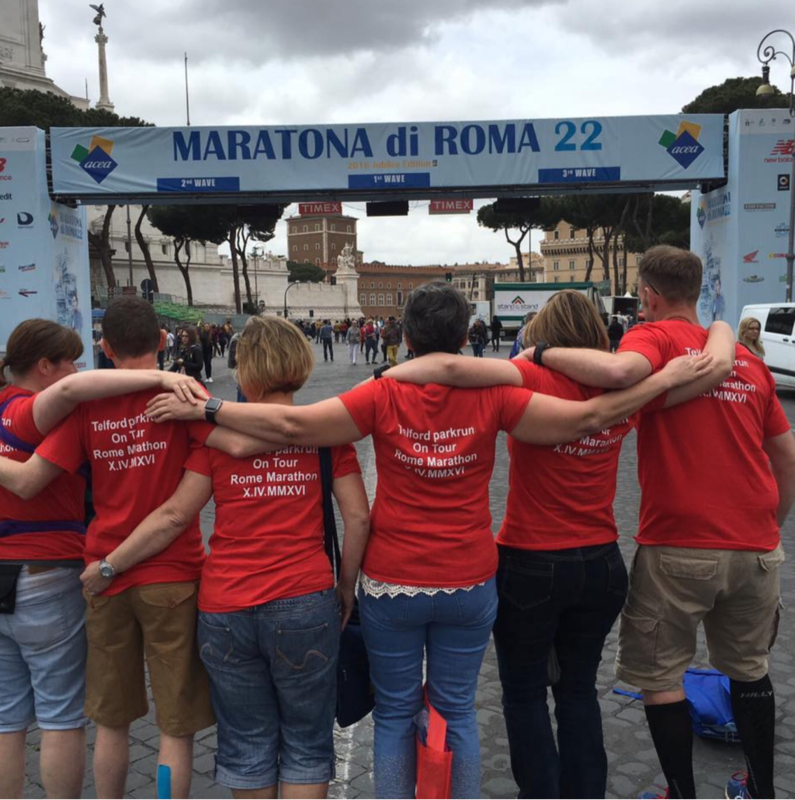 ​Early last year fellow Wrekin Road Runner Robin Hartley came up with the idea that Telford parkrunners should go on tour and run a marathon somewhere in Europe. Rome was decided upon as it is an iconic location and would be right in the middle of the Easter school holidays. 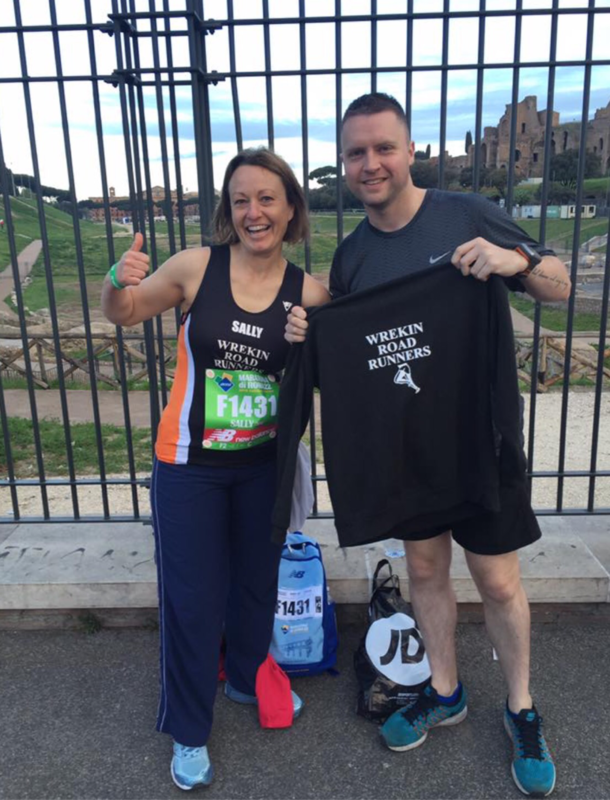 Parkrunners were keen and many signed up and booked accommodation, only to be told a few weeks later that the Pope had announced that 2016 would be a jubilee year with celebrations on the 3rdApril so the marathon would have to be put back one week. The new date meant a lot of people could no longer make it, but luckily our hotel agreed to change our booking (but charged us more) and we had not yet booked our flights. What it did mean though was running a marathon on the Sunday, taking a flight home that night and being in work the next day. I decided I could do it. 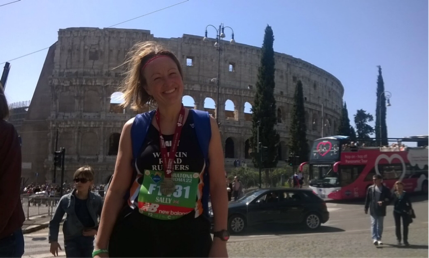 Rome is a beautiful city and the marathon started and finished at the Colloseum. We arrived well before 8am so after a few pre-race photos I headed for the bag drop and toilet. The queues were very long and slow moving, but I really had to go so I had no choice but to wait in line, fighting to keep my place and moving forward. By the time I had been I missed my start wave and had to join another very long and slow moving queue to get to the start line. I had planned to start the race with Robin who was carrying a knee injury but there was no way I was going to find him in the crowd. I finally started at 9:01am and the sun was already beating down. The centre of Rome has cobbled pavements, which is not an easy surface to run on and I saw quite a few runners fall later in the race when fatigue had set in. Much of the race was along the river and we crossed it four times. I welcomed this, both for the views and the breeze. We passed many of Rome’s top attractions, including Circo Massimo, the Vatican and St Peter’s Square, the 1960 Olympic village, the Spanish Steps and Piazza Navona. There was support all along the route, and I was amazed by the number of times I was cheered on by the Telford parkrun support crew, and in particular fellow WRR Lorraine Holmes. That lady was everywhere. I was hoping to complete in under 4:45 and I kept a steady pace for the first 16 miles. There were water stations every 5km which gave out water and energy drinks in cups. The Paris marathon had given out water bottles which allows you to keep running and drink as you need it, but drinking from cups forces you to walk for a bit. There were sponge stations halfway between each water station which provided more welcome relief from the heat. Rome has drinking water fountains all over the city and I even stopped twice to use these. The last ten miles was incredibly difficult. It was hot, there were two small inclines and more cobbled streets. I wanted to keep at 10:30 min miles but I was slowing down, and so was everyone else. Runners started walking and dropping out. Ambulance sirens were continuous and we often had to move to the side to let ambulances pass. People were being carried off on stretchers attached to drips. I spotted a pharmacy sign that told me it was 26°C. At this point I decided not to be too hard on myself and that it was ok to keep walking if I needed to. My new goal was to finish without requiring medical attention. If I could finish in under five hours I would be satisfied and if I could beat my Snowdonia time of 4:52:57 I would be even happier. So I pushed on walking and running through the now very crowded city ccentres to the finish line where I collected my medal and was congratulated by the parkrunners who had finished ahead of me. I had beaten my five hour goal but was 57 seconds slower than Snowdonia. I’ve decided I will take hills over heat when it comes to running. All that was left to do was collect my bag, meet my husband (who had spent the day failing to spot me in the crowd), eat some lunch and head to the airport for our 9:25pm flight to Luton. I managed to crawl in to work the next morning having had three hours sleep and taught every lesson proudly wearing my medal.